One of the new beautiful parks in downtown Red Deer is located on the north west corner of 45 St. and 52 Ave. However, while the park is new, the main feature of it is a treasured landmark from Red Deer's past, the fountain that was originally gifted to the City of Red Deer by Edward Michener. Edward Michener was born in Tintern Ontario in 1867, the year that Canada became a nation. After studying theology, he moved to Alberta in 1895 where he took charge of the Methodist Church in Banff. In 1897, he married Mary Roland, also of Tintern Ontario and they moved to Lacombe. While at Lacombe, their oldest son Roland was born, a future governor general of Canada. Ill health forced Edward to resign his ministry. In 1901, the Micheners moved to Red Deer where Edward went into the real estate and mortgage business. For a while, the Micheners lived in the red brick house on the corner of Mann (49) St. and Nanton (48) Ave., currently the offices of the law firm, Lee and Short. Edward later built a grand new house on the brow of the East Hill, in what is now known as Michener Hill. Meanwhile, Edward went into the land development business with his partner Stan Carscallen. Among the subdivisions that they developed were Parkvale, Highland Park (Michener Hill), Grandview and Hillsboro. With Red Deer growing very rapidly, Edward Michener and Stan Carscallen were soon two of the wealthiest businessmen in Red Deer. In 1904, Edward ran for mayor and was elected by acclamation. He served for three terms. In 1906, as part of a bid to make Red Deer the capital city of the new province of Alberta, he offered 10 acres on the north east corner of the East Hill as a site for the provincial legislature. While the Lieutenant Governor, Premier and all the M.L.A. 's were in Red Deer to hear the presentations on Red Deer's bid to become the capital city, a ceremony was held in the park in front of the C.P.R. station. All the visiting dignitaries planted trees in the park to commemorate Alberta becoming a province. In 1907, Edward Michener decided to give the park an impressive centerpiece. He donated a beautiful ornamental fountain, which, once installed, was surrounded by a large concrete bowl. The fountain and the park became of the landmarks of the community. Edward later went into provincial politics. He was elected as Red Deer's M.L.A. in 1909. He became the leader of the Alberta Conservative Party and served as the leader of the opposition in the Alberta legislature. In 1918, he was appointed to the Senate. He passed away in Ottawa in June 1947. Ironically, in 1955, while Alberta was celebrating its 50th anniversary as a province, a proposal was made to turn the beautiful C.P.R. Park into a parking lot. While initially nothing happened, in the summer of 1960, the park was finally paved over, the trees were all cut down and the fountain removed. Fortunately, the fountain was salvaged by Russell McFaul, a local contractor. Coincidentally Russell's brother in law, W.J. Goard, was the original builder and owner of the brick house on 49 St. where the Micheners used to live. The fountain was later sold to Ken Martin, who used it as a centerpiece in his yard at Penhold. Mr. Martin very generously decided to donate the fountain back to the City of Red Deer, on the understanding that it would be put in an appropriate park setting and with a promise by the city that the fountain would not be discarded again in the future. The original C.P.R. Park site is now the location of the Clarica building on 51 Ave. Consequently, a new park was created, south east of the Medican complex, along 52 Ave.
Red Deer once again has its landmark fountain for people to enjoy as we celebrate the 100th anniversary of the province. C.P.R. 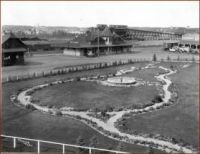 Station Park with the Michener Fountain in the centre and trees planted to commemorate Alberta becoming a province along the edge.